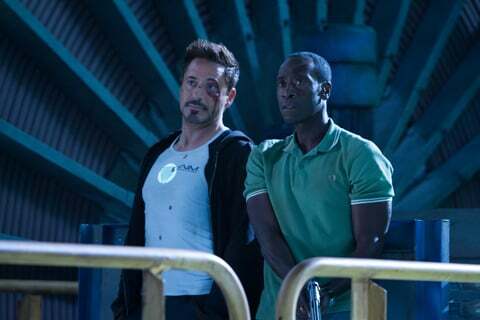 We all know already that Tony Stark is going to get the snot beaten out of him before saving the day in Iron Man 3. It's been right out there in the open from the moment they brought the first footage to Comic Con last summer, showing his Malibu house crumbling into the ocean. While in Iron Man 2 Tony was mostly beating himself up, this time he's facing external forces-- and he's showing signs of it in three new images that have dropped online. There are actually a lot of intriguing details in these images from the latest issue of Empire Magazine (via Stitch Kingdom), and let's be honest, it starts with the amazing combination of patterns on geneticist Aldrich Killian, played by Guy Pearce. Check out that menswear! 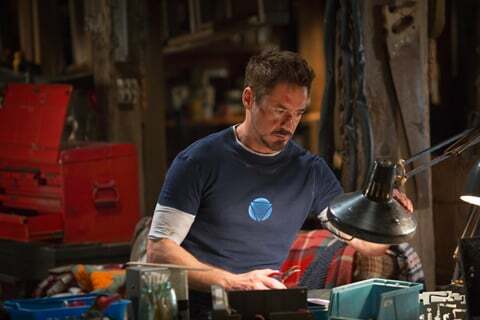 OK, fine, so fans of the comics might be more intrigued by what Tony Stark is wearing in another image. It might just look like your average white T-shirt, but that shirt's logo AIM stands for Killian's Advanced Idea Mechanics-- the company that creates the nanobots that empower Ben Kingsley's Mandarin villain. Is Killian like so many other Iron Man villains, a perceived ally until he turns bad? Or is Iron Man playing some kind of role in spreading those nanobots himself? Finally we've got a look at Tony back at work in what looks like an improvised version of his lab-- or maybe snooping around someone else's office entirely. He still looks pretty rough, but at least that nasty cut on his face has started to heal. Iron Man 3 comes to theaters on May 3 this year. You can click here for everything else-- including a whole ton of images-- we know about it so far.